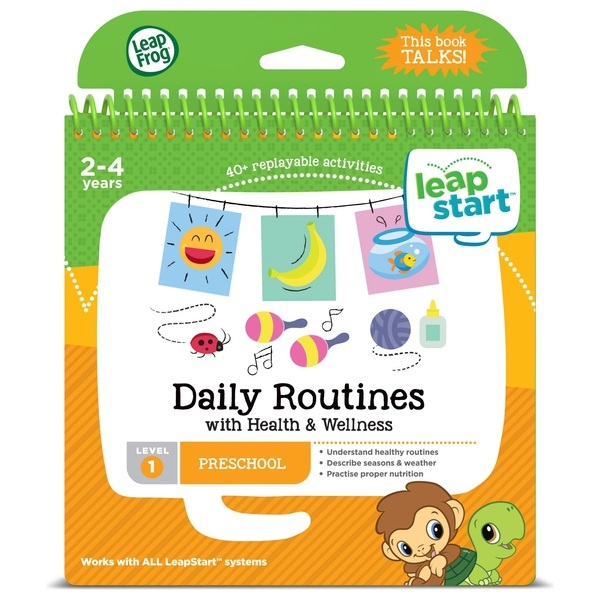 LeapFrog LeapStart Nursery Activity Book: Daily Routines and Health & Wellness is an interactive activity book that talks, sings and comes to life with 30+ replay able activities for Nursery covering Daily Routines and Social Skills. Join the Learning Friends as they share their day, introducing daily routines and healthy habits in fun and surprising activities. With this LeapStart book, kids explore 16 key daily routines and wellness skills for school and life, including understanding daily order and time, describing types of weather and the seasons, and understanding how to communicate politely. Activities are designed around a fun-filled day at Nursery and also incorporate play, dress up and healthy habits. Most activities are designed with two levels so kids can play and learn at the right level and then advance when they’re ready. As kids master a new skill, they’re prompted to place one of the included stickers (more than 25 in all) on the reward page to celebrate their accomplshment and motivate them to learn more!